If you drove every mid-size SUV on the planet to the most trendy restaurant or club in town, the Porsche Cayenne and BMW X5 would get parked up front. Valets have a duty to pay attention to this styling stuff, since it identifies the likeliest over-tippers. The Range Rover Sport is also a contender in this status contest. The latest technology and design guarantee this treatment. Some of that technology includes super-bright xenon headlights that turn with the steering wheel. We like this feature on the X5 and they follow the driver's wishes slightly more accurately than those on the Lexus RX 350. Cargo space is five cubic feet larger than that of the Cadillac SRX, and 11 cubic feet larger than that of the Volvo XC90. Rear legroom in the BMW is the same as that in the Volvo and a few inches less than the space in the Cadillac, which is the longest luxury SUV at more than 194 inches. Although the X5 has all-wheel drive and is considered an SUV, it has no low-range for its four-wheel-drive system and it rides as close to the ground as other luxury SUVs which is around eight inches. So we'd keep it on the road, not off. Snowstorms are okay, sand dunes are not. It favors sending most of the engine's torque to the rear wheels, great for handling, but it changes instantly when wheels at one end of the car start to slip. This is a good system for bad weather. You wouldn't know that you're inside an SUV in the BMW X5. Rather, the cabin is appointed and designed like BMW's sedans. Materials are first-rate, and fit and finish are top quality, with controls that work well with minimal slop and maximum precision. This is equal in the benchmark standard to the Lexus, Infiniti and Mercedes SUVs. Our test X5 had the optional Sport Package seats, and our passengers complained of exiting the front seats and hitting the side bolsters. We understand that spirited driving requires coddling the driver in a stationary position, but not many of us sporting drivers can wring out a car with a full load of spectators. In fact, most passengers prefer we drive like grandmas, so we see little benefit to locking in passengers into their chairs as tightly as the driver. Rear-seat passengers report to us that the cushioning of the rear seats is soft on the road, and very comfortable. The extra length not only adds some cargo ability, but the rear seats are adults sized, we found. A third row of seats is optional, raising capacity to seven people, most of them adults. BMW claims adults up to five-feet, four-inches tall will be comfortable. Visibility is compromised by the thick D-pillars of the longer body, which means you have to slowly exit parking lots, though it doesn't seem a big giveaway in exchange for the trim styling. The surface upholstery feels luxurious, and the perforated seats kept us feeling fresh after a three-hour drive without stops. The optional active driver's seat is like a Sharper Image massaging lounge chair, and it really keeps your back in shape on drives longer than three hours. The climate controls are able to be used separate from the devilish iDrive system, which means you can immediately set them for cooling and heating. When accessed through the iDrive system, you need an instructor and a two-credit college course to master the best use of the system. People over 35 are not ready for this technology, whether it be ultimately good or bad, although younger buyers younger are likely used to this serial-delay electronic reaction: push button, wait, wait some more, then accept the function works without any feedback. The audio, like the climate control, is also usable separate from the iDrive system. There's an actual knob for volume control, which to date is mankind's best solution for this function. We found the sound from the optional premium system to be tremendous. However, we were discouraged from taking full advantage of the sound processing features because of the complexity of the iDrive control to set it. Simple does not mean fewer buttons. Cadillac's Allante of 1986 had rows of dozens of buttons on its center console to operate all of its advanced functions, and although it looked complex, each button had only one function, and therefore was stunningly easy to use. At the same time, Buick introduced a touch-screen cathode ray tube touch control for its functions, that required different screens just to operate simple commands like climate and audio, and it was universally panned by critics. BMW obviously missed this episode in auto history. A side note, however, is that Buick Riviera owners really liked the touch-screen system once they learned it. Buick still killed the system a few years later under pressure from critics. Perhaps the best function of the BMW iDrive system is that it solves problems inherent with on-board GPS-based navigation systems, which like every other system is based on the exact same software data. Navigation systems are usually slow to move maps so you can see where you want to head before you know where your exact destination is. The iDrive control allows you to rapidly zoom in and out of maps, more the way you'd look at a paper map to get a sense of where you are. 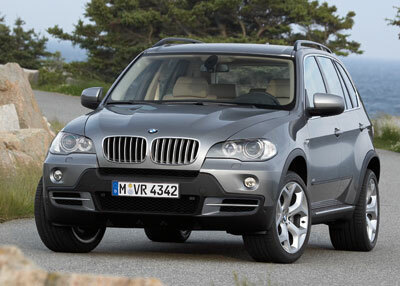 The BMW X5 4.8i we drove was notably quick to take off, despite its substantial curb weight of more than 5,000 pounds. BMW credits its new six-speed transmission for this rapid forward response. At deep throttle, the V8's pleasant, distant growl never intruded on cockpit conversations or speakerphone communications. We averaged 17.5 mpg on a rapid highway drive, pacing traffic at 80 mph. In-town errands lowered that average to below 15 mpg, which is the price you pay to have this gutsy engine at the ready. However, we rarely gave in to temptation to use full-throttle and make maximum use of the V8's 350 horsepower and the linear delivery of its 350 pound-feet of torque. You will not find a better delivery of engine power. BMW's V8 is as quiet as Cadillac's SRX, and feels more isolated than the Infiniti FX45. It feels much quicker than the Lexus RX and Mercedes M-Class, as well as the heavy Audi Q7. The quick-reacting throttle is biased for pavement driving, opposite the M-class Mercedes, which has much longer pedal travel for more sensitive slick-road and loose surface maneuvers. The X5 ride feels stiff at first, yet none of the passengers we had in our test car complained. On a twisty section of country lane in Michigan lake territory, we unleashed the suspension of the X5, and couldn't safely find its upper limits on public roads. It will handle bends that would have the Lexus plowing, and where the Mercedes ML350 and the Volvo XC90 would be leaning like an America's Cup sloop in a gale. The X5 with optional 19-inch wheels and tires grips as well as the capable but more compact Infiniti, yet you sit higher in the BMW, which exaggerates the feeling that it's sticking tight to the asphalt. Braking produces dive that alerts passengers that something alarming could happen, yet at no time even in heavy traffic did we feel we were near the limit of stopping ability. A new brake fade control from BMW compensates for heavily used brakes. Brake application remains easy and smooth, and what's even better is that slight applications of the brakes to initiate attitude changes in the X5 when driving with alacrity on twisty roads are easy and natural. This is an SUV made for the Nurburgring. The BMW X5 3.0i offers all of this handling goodness. Its six-cylinder engine produces 260 horsepower, which is not exactly low-powered; it's 35 hp more powerful than it was in the previous-generation X5. We found that the inline-6 is smooth and revs evenly throughout its operating range. With lower output it requires slightly more patience. You get the impression using BMW's iDrive controls that a conference room full of engineers decided how you should live your life and created an overdose of convenience technology intended to help you, but their guesses and compromises failed. The X5 is at the top of its class in terms of sporty driving dynamics, making us wish we could purchase an X5 stripped of gimmicks. Comfort, the usefulness of space, and sport sedan performance are the true reasons this SUV made us happy to drive it anywhere. Phil Berg test drove the X5 in rural Michigan before filing this report to NewCarTestDrive.com. Head/hip/leg room, f: 39.3/na/40.0 in. Head/hip/leg room, r: 38.3/na/36.6 in.